SMART DESIGN The Cutlery Wood Rack is a divided box that rests on runners, creating two tiers, so there’s more space in the same footprint. SMART DESIGN Re-arrange the dividers to fit your stuff. 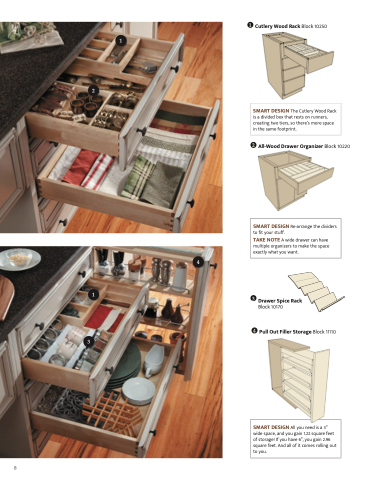 TAKE NOTE A wide drawer can have multiple organizers to make the space exactly what you want. SMART DESIGN All you need is a 3” wide space, and you gain 1.22 square feet of storage! If you have 6”, you gain 2.96 square feet. And all of it comes rolling out to you.